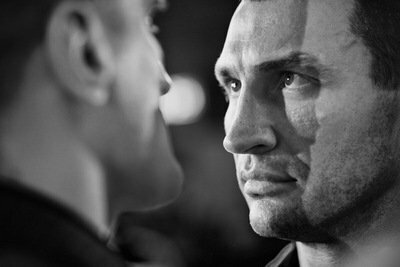 By Rob Smith, photo: michaelsterlingeaton.com – IBF/IBO/WBA/WBO heavyweight champion Wladimir Klitschko (58-3, 50 KO’s) will be defending his titles this Saturday night against the huge and lumbering Mariusz Wach (27-0, 15 KO’s) at the O2 World Arena in Hamburg, Germany. Wladimir says he’s taking this fight against the inexperienced Wach because none of the other top heavyweights want to fight him. It’s hard to imagine that being true when there are arguably at least 20 heavyweights that Wladimir could pool from that would give him a tougher test than the 32-year-old Wach. Perhaps the more likely reason that Wladimir selected Wach, besides him being an easy mark, is because of the large Polish fan base that Wach has. Setting up a fight with Wach is a good money bout compared to some of the other more dangerous options. This is why Wladimir will likely take on another Polish heavyweight in Tomasz Adamek next year in what shapes to be about as bad a mismatch as Wladiimr’s fight against Wach. Wach is still at the elementary stages of his career in terms of opposition. He’s been spoon fed mostly journeyman level 3rd tier opposition and he’s done what he’s had to do to beat these guys. But Wach should have started facing at least B level opposition before being given a title shot. Just throwing him out there is almost unfair to the guy because he’s faced such god awful opposition his entire career. Wach at least should have fought a bottom level 1st tier fighter so that he could learn something while at the same time proving that he belongs in with a heavyweight champion. But the way it’s been set up, Wach is going to be fighting for a world title next Saturday off of Tye Fields, Kevin McBride and Jason Gavern. That’s just wrong. Wladimir could and should do better than this in selecting his opposition, because it just makes it look like he’s milking his title as he heads in his final years as the champion.